Consistently share links to your website via your Facebook, Twitter and other social media channels, and encourage others to pass along the information as well. Speaking of links; Here’s a few of ours: Fina Promos Website FinaPromos Facebook Page I find myself struggling with this at times. But really, the next time you are sending off an email try and take a few seconds and include a link to a special blog post or article from one of your social sites or website that would help, entertain or amuse your recipients. Include links to your website in email newsletters and other updates to customers. Posting a link back to your website on your LinkedIn and GooglePlus Page updates/posts can greatly increase your search engine optimization efforts. Again, without being a self-serving spammer, try to include your website link if it would actually be helpful to your associates or readers. Host or sponsor local events, or provide discounts for neighborhood students, and then encourage neighborhood businesses, the local chamber of commerce, charity organizations and other partners to link to your website when talking about those activities. And don’t forget to return the favor. Create a local directory of community resources including your favorite nearby restaurants, stores and cultural attractions, to provide an opportunity for you to link out to others (and for them to return the favor). Even consider starting a blog where you can talk about your business’ neighborhood and link to businesses and places of interest. However, be sure that your link strategy is authentic in that you know who you are linking to and that they have relevance to your business. Also, do not create link schemes like spamming your business’ domain name on websites, forums or blog comments. Social media sites play a key role in local business’ visibility in search results. When a potential or current client Googles your business, (and believe me they will before deciding to do business with you) ideally, your business website should appear first, followed by social sites. The more proactive your social media strategy, the higher likelihood your pages will attract followers- and in turn, appear within search. Give it a try. Google your name or company name. Does your website appear first? Where do your social sites appear and in what order? I tried this with my company name – Fina Promos My website appears first followed by Fina Promos Google Plus Page, Fina Promos Facebook Page, Fina Promos LinkedIn Page, Fina Promos Pinterest, My You Tube Page and finally my blog. Post updates on your new products or services offered. Can you feature a “product of the day, week, or month” and highlight the benefits? Highlight stories of relevence to your customers. Who is your target audience and what are their concerns? Posting about things happening in your city or town puts you on the map with local rankings! Engage on social media by responding to those reaching out to you via your social sites with questions or feedback on their orders. I hope these few tips help you see good results with your visibility online. via SEO In 2016: What It Means For Your Content Strategy. I love precise, easy-to-understand articles that help me stategize my marketing efforts for my small business. To be honest, I do not often find them in the vast sea of “content articles” on the web. However, this morning I read an article written by Jessy Smulski, contributing author for Business2Community that I feel is share worthy. Click on the link at the top of the page to read the full article. So, research shows us that these four factors are important aspects for SEO in 2016. Mobile Browsing is Boss. Stop procrastinating on this. Get your website on par. Social is Increasingly Important. Yep. Stop thinking Facebook is a waste of your marketing time. Voice Search is a Game-Changer. People talk to their phones to find you. Achieving effective local search engine optimization for your business is like striking gold. In my last blogpost, I suggested that we begin with properly optimiizing information that appears on your business website. Read article Today, we will discuss an issue often overlooked by small business owners-How your business appears on websites and business listings. Search local listings websites like Facebook, Yelp, GooglePlus, YP, Yellowbook and TripAdvisor to be sure your business is actually listed. If not, be sure to claim those listings, and be consistent and acurate with your business name, phone number and address. If your business is listed as located on 6th St., use 6th St consistently, NOT Sixth Street. Make changes as neccessary and delete duplicate pages. Include videos, photos, your website URL and any other key information to make your listings attractive, interactive and informative. I get reaaly annoyed seeing the unprofessional looking “blue silhoette” in place of a photo or logo. Really. COMPLETE the listing. Work with a “listings provider” such as Moz.com to automate the process for all local sites. Usually the price for this service is reasonable and worth your small investment in dollars compared to your large investment in time to care for this manually. Does your business have more than one location? Create a seperate listing for each location on your website to boost visibility of your brand and each of your stores or offices. If you’d like more promotional product ideas delivered to your mailbox twice monhly subscribe here. Do you own or manage a local small business? If so, you’re no doubt painfully aware of the need for strong local SEO (search engine optimization) success. Just like your computer is the new typewriter; Local search engine optimization is the new Yellow Pages. If you want to be found online, you must be seen online. Your website is your most important and valuable online assest, so ensure that it is properly optimized to appear high within search results. Let’s assume you do not have thousands of dollars to spend on SEO AdWords. Here are 4 action items to boost your local SEO. Choose a domain name that reflects your business location and business type. For example, Joe’s Lawncare located in Pittsburgh, PA could use the domain “joeslawncarepittsburgh.com” which says it all. Add key words on page titles that identify with your business, its products and services and its location. Be sure to add your business name, phone number, address and social media links on EACH INDIVIDUAL PAGE of your website, not just your homepage. In your website copy, be sure to mention not only your products and services, but include as much as possible about your local area. This associates your business with the nearby vicinity. Remember, we are after LOCAL optimization here. Include if possible, what sports teams plays in your city, what section of town you’re in, what special place of interest is just around the corner. Not only will this added information improve your website copy for customers, it will also boost your search visibility as a local business. My next post will discuss how to utilize local business listings to boost SEO success. As a kid, I loved the Peanuts characters created by Charles M. Schulz. In particular, my favorite cartoon character was Snoopy. He was the original cool and trendy dude. Joe Cool was my hero. His trademark round sunglasses and “Joe Cool” turtleneck sweater (imprinted with his name, no less!) continues to be a timeless fashion statement. With his little buddy Woodstock following in tow, he projected the silent (Literally, silent. He was a character that did not speak) message that if you were to be seen with him, you must project your own trendy coolness. What does Snoopy teach us about building our brand image? – That it’s hard to overstate the power of cool! When a product has that cool factor, you appreciate it, tell your friends about it and want to associate yourself with it. Whether that comes from a killer feature, a unique design, or a striking aesthetic, branded products that wow the recipient will give your business a trendy brand image. So, How can your business and brand be more like Joe Cool? How do you wow your audience? One easy way is to incorporate the latest retail product trends into your marketing programs and company events. 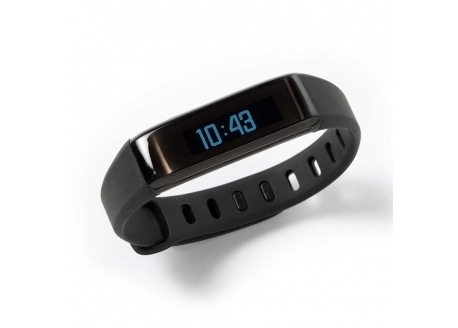 When choosing premium customer or employee gifts, promotional items, or even apparel branded with your logo, pick (appropriate) branded products that say “trendy’ like a Bluetooth Activity Band. Doing so will allow you to take advantage of an already hot trend..
Wearable technology is huge right now in the consumer market. I was meeting with a client last week who was wearing one of these and I have to admit that I felt a bit left out of the cool factor. After all, I am in the branding business. I SHOULD have the latest trendy tech products items, right?! My point is to put the latest consumer trends to work for you and your marketing brand. Whatever promotional item you decide to align your brand with, be sure it is associated with quality, popularity, and a positive emotion. Visit our promotional products catalog pages for the latest trends in branded products or tap on image for more products that project the “Joe Cool” factor! 13 product ideas of what’s cool and trending right now.